IMG_2966, originally uploaded by pengellyplace. Curling grippers are part of the equipment used for a game that some of us Canucks (and other nations) play on ice. The ice is divided into lanes like bowling and you slide rocks that look like flattened bowling balls with a handle on top down the ice towards rings of colour painted in the ice. Sort of a cross between bocce ball and bowling on ice. To encourage the rock to go to the 'right' spot you sweep the ice in front of it whilst yelling at it energetically. Think competitive sweeping. To do all of this you wear a slider on one shoe - so's you can slide on the ice and a gripper on the other - so's you don't fall down. I figured they'd make the perfect waterproof bottom for these boots. I just glued them on with shoe goop. 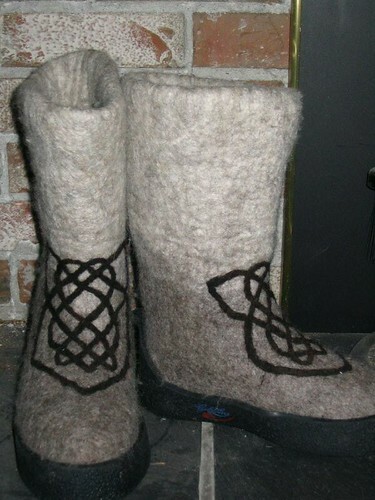 They are so toasty warm that I can't wear them unless it's at least -5 C.
These are amazing! They look fantastic - and what's 'shoe goop'!! Thanks Steph - shoe goop is a brand of glue. Comes in many flavours like Shoe Goop, Craft Goop, Jewellery Goop, Wood Goop. All good glues.